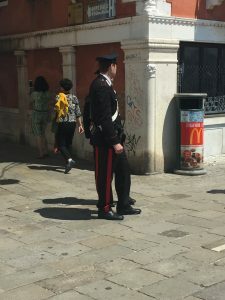 Our Benvenuto Driver was scheduled for 10:30 AMto pick us up for our transfer back to Naples to catch our 12:30 PM train to Venice. We were early enough to take in the free breakfast and this made a very nice start to the day. The patio doors were wide open to let in the morning sunshine and a beautiful breeze off the Mediterranean Sea. Another beautiful day at 25C. Breakfast was really nice and was similar to the Fenix Lisboa with great variety. This venue was much more nicer overlooking the water and the ability to stroll out on the patio after breakfast for a lingering cup of coffee and tea! Back to the room after breakfast and we were all packed for our trip up to Naples and onto Venice. Our Benvenuto Driver was right on time. 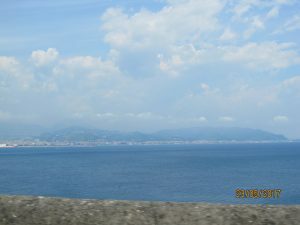 We were on the road by 10:30 AM and driving back to Naples. 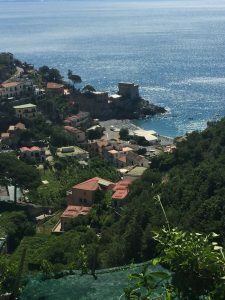 Our views of The Almalfi Coast were even more spectacular than on the way down. Our vantage point on the way back was different, as well with the morning sunshine gave us a different perspective of the beautiful scenery. Our driver was kind enough to stop a few times along the way for some pictures which we appreciated very much. Some Spectacular Views & Our Driver Stopped & Took Some Pics with the Amazing Scenery in the Background! 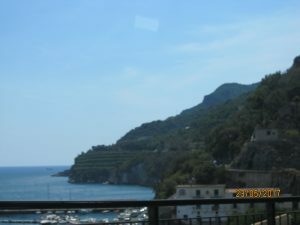 The drive back to Naples was uneventful once we left the narrow coastal highway. 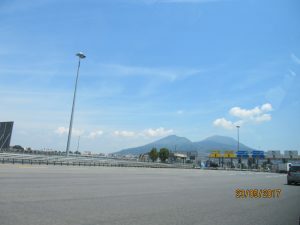 We arrived at the Naples Train Station at around 11:45 AM. We witnessed some traffic wars at the train station. Our driver did not like the slow speed of the car ahead of us and leaned on the horn. The female driver ahead responded with the finger! More horn blowing, finally she got out of the way and our driver could park us at the train terminal and get on his way. Very funny for us, not so for the drivers involved! The Italians can be a little impatient and expressive! ! 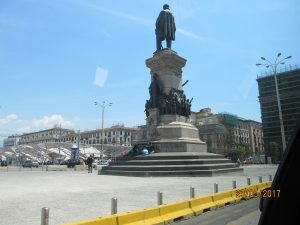 The Busy Streets of Naples! 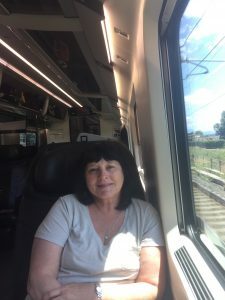 We were booked on Trenitalia’s High Speed Frecciarossa from Naples to Venice. Frecciarossa Trains reach speeds of 400 KM per hour. Much faster than our old Newfie Bullet! 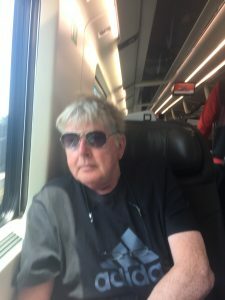 The trip up to Venice was scheduled to take less than 5 hours and at 143 Euros for two in Executive Class, not a bad way to travel. We had facing seats in our own compartment separated by a nice table to place your drinks upon. A very nice way to travel indeed! Our Train ride to Venice! Naples Train Station was very basic and certainly not on the same scene or scale of Rome Termini. Our train and track was quite easy to find and our train departed on schedule at 12:30 PM. 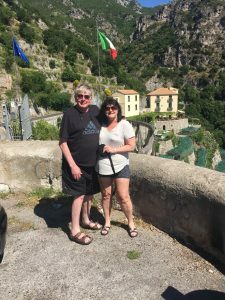 We had stops in Rome, Florence, Bologna among others up the Italian Peninsula to Venice. Travelling at speeds of up to 400 KM per hour the countryside unfolded very quickly with not many hills and mountains as we had seen on the way down! The scenery is not outstanding, however everything is green and there are lots of farms with some hills and mountains! Hubby went back to the restaurant car to pick up some sandwiches and beer and wine. He came back about 30 minutes later. Service was very, very slow. About 25 Euros for lunch, but this was a better alternative than waiting for service from the food and drink trolly which did not reach our car for another hour and a half after Hubby returned. Cell Service on the train was spotty. But it didn’t seem like an overly long trip. 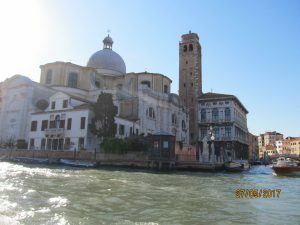 We arrived in the suburbs of Venice around 5:00 PM. Of course Venice is on an island and the route into Venice crossed a causeway. The terminals were easily visible and there were lots of them to get you over to Venice. 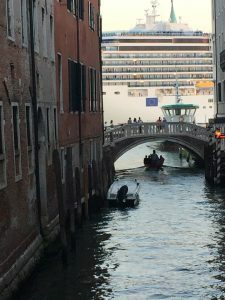 There are over 600 cruise ships visiting Venice each year, 60,000 cruise ship visitors everyday! 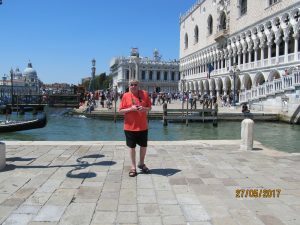 A big problem for Venice now and as we were to find out later, a difficult place to navigate when they come into port! Arriving on the Venice Waterfront! Venezia Santa Lucia is the central station of Venice which is located on the northern edge of Venice’s historic city. The building is low and wide with a sizeable main hall and has 16 platforms handling 82,000 passengers per day and 30 million annually. 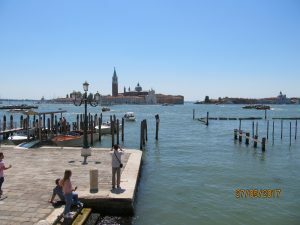 To say that everything is centred around tourism in Venice is an understatement! 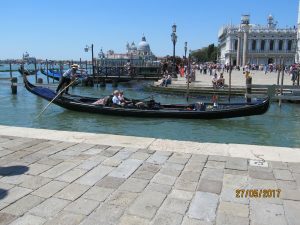 When you exit the station the Vaporetto Public Water Bus is easily accessible as are the private water taxi boats. We wanted transport directly to our hotel so we jumped in a water taxi and gave the driver the name of our hotel and the location. We agreed to a 50 Euro fee up front (this was the recommended rate). It was expensive but saved a lot of time and numerous stops and inconvenience! Hubby on the Water Taxi over to Venice! 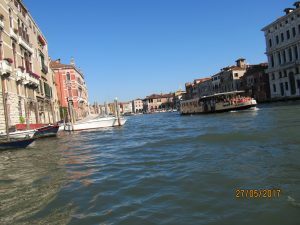 The trip down the Grand Canal was very exciting with lots of boats moving in all directions. 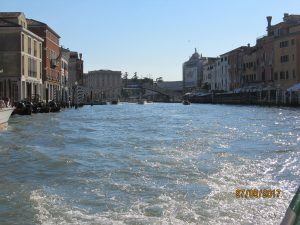 The Grand Canal snakes through the Island of Venice. Our trip was 3.8 KM and the canal is 30 meters to 90 meters wide in places. 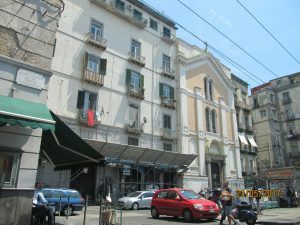 Our hotel was located in the San Marco Sesteri which is located in Saint Mark’s Square, and near Doge’s Palace, St. Mark’s Basilica, the Rialto Bridge and Harry’s Bar. This is where all the top attractions are. 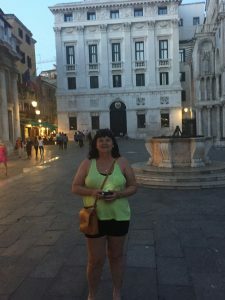 We were paying big bucks to be here, 600 Euros for two nights, but it was a once in a lifetime opportunity to visit Venice. Given our short stay we wanted to be in the middle of all the action. 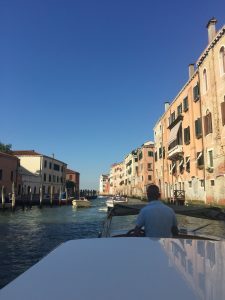 We had less than 48 hours to experience what we could of Venice! 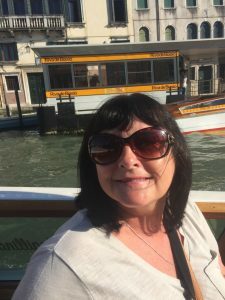 MK on the Waterfront Awaiting the Water Taxi to Venice! We really enjoyed the 30 minute boat ride. All of the buildings in Venice are built on piles. Water, water everywhere! Its amazing that you can’t go anywhere except by boat. Our hotel the Hotel Bisanzio was a fantastic hotel and only a few minutes walk from St. Mark’s Square and the Basilica and right on the Riva Degli Schiavoni, a great location and really made our stay in Venice unforgettable! A few minutes walk and we were right on the Grand Canal. 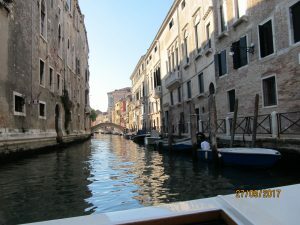 Our water taxi delivered us to a small dock and we headed up an alleyway and found it no problem. Approaching the Landing for the Hotel Bisanzio! The Amazing Huge Cruise Ship in the Foreground! The Hotel Bisanzio is housed in an ancient Palazzo which was once the home of the great sculptor Allesandro Vittoria! Look him up on Google to find out more about him! 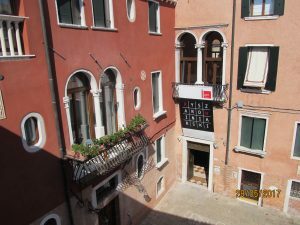 Our check-in was very smooth, and they made a reservation at a nearby restaurant for us which they said would be easy to find in the maze of Venice’s back streets and courtyards. The Landing to the Courtyard of the Hotel Bisanzio & the Courtyard Overlooking our Room! See the Art Gallery Across the Way! Our room at the Hotel Bisanzio had it all, parquet floor, murano glass lamps and open beams. Our room windows opened onto a private courtyard, the same place we entered when we departed the water taxi to get to the hotel. Our room also faced what seemed like an art gallery, as I could see that throughout our stay it was open for business and there were many appreciating the art on the walls of the lovely lit gallery! Our room had air conditioning, Wi-Fi (which worked very well), a radio, mini-bar, hair dryer and a safe! 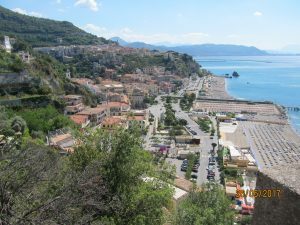 The bed was outstanding and very comfortable, a Queen size and definitely an upgrade from the Hotel Pietre Di Luna on the Almalfi Coast. We were so grateful to get a nice bed to sleep in and on! 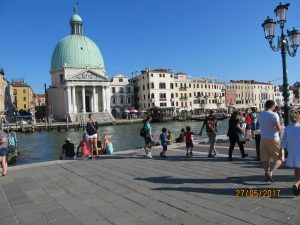 We really felt that we were getting value for our money given the location we had selected in Venice. Breakfast was also included in the room rate! All was good! Out and about Venice! 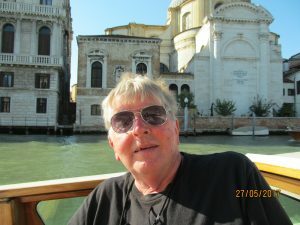 Hubby on the Grand Canal! 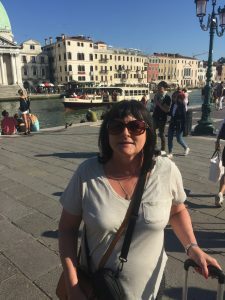 We had time before dinner to take a short walk out onto the Riva Degli Schiavoni along the Grand Canal. What a beautiful evening and it was still sunny at 8:00 PM and it was 25C. The weather had been fantastic this whole trip. There were lots of people walking about this evening and it really was a magical way to explore Venice without the crowds and stroll along the Grand Canal and view the the absolute beauty of Venice from the waterfront! The buildings across the canal were amazing to see and the warm breeze coming off the Grand Canal with the sun setting only made it even more spectacular! This is what I had imagined Venice to be!! 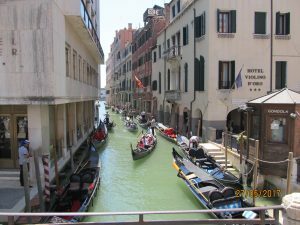 More Views of the Grand Canal and Internal Waterway Streets of Venice! 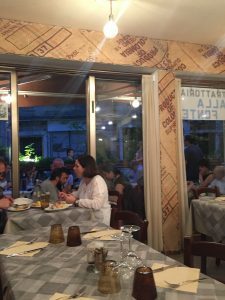 We walked back to the Hotel Bisanzio, down the small alleyway off the waterfront and turned right next to the hotel and we found the restaurant that the hotel valet had booked for us a few blocks down the alleyway! It was quite crowded when we got there, so there was no seating outside so we were seated inside which was a small restaurant with the kitchen in back. We were quite near the bar so we could see the goings on of the waiters and staff! After a perusal of the menu and some discussion with the waiter or perhaps the owner it seemed, Hubby ordered a monkfish complete with a tail, backbone and head! Better him than me I thought. Hubby was going to get adventuresome on our first night here I thought! 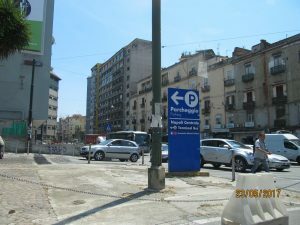 Our First night out at a restaurant booked by the Hotel & a Policeman at the corner of the street to the Hotel Bisanzio! It was difficult to concentrate on the delicious monkfish meat with those beady eyes staring at you, I thought! But Hubby prevailed! I ordered Veal Picatta which was ok, a little tough I thought though! With a bottle of house wine, dinner came in at 35 Euros total including tip! Fantastico! However, I did have a foreboding about the food again in Italy after this meal in Venice! 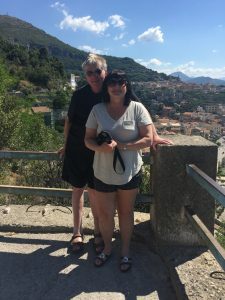 Quite frankly, we did not have any outstanding food in Italy the whole time we were there and we ate at many, many places! We walked out to the Grand Canal Waterfront again after dinner. All alleyways lead back to the Grand Canal! The large crowds that had been there earlier had disappeared. 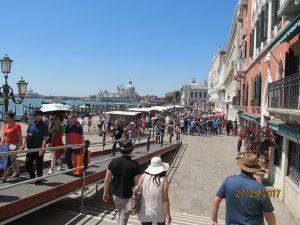 We would learn that this was normal on the San Marco Sistieri after the crowds from the cruise ships had left for the day. The lights of the island of San Giorgio Maggiore looked beautiful across the canal. We will remember that evening forever!!!! MK After Dinner! Lovely Warm Nights in Venice! A New Day in Venice tomorrow!